Survive in France... If you don't speak any French, be reassured; here's the good news! Lots of people in France speak English, specially young people, and people working in tourism in Paris and the main holiday regions. Now for the bad news there are also lots who do not - even working in the travel and hospitality business. Here therefore are twenty-five of the most important French words to learn, and twenty-five simple French phrases that could well come in useful during a trip to France. (The pronunciation of each word is indicated in brackets). The sound represented below as "eu" is the "er" sound in the British pronunciation of the word her, or the "ur" of fur. So French Je more or less rhymes with English her, or with the word the before a consonant (as in What's the matter?). 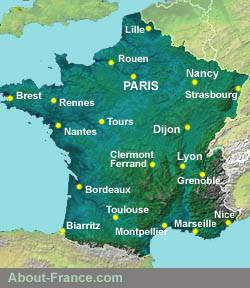 Click for best online rates for hotels near the following towns on main routes in France. A quelle heure est-ce que cela ferme ? Where are there some restaurants, please ? Je cherche un distributeur de billets. Nous sommes très pressés / en retard. Quel temps va-t-il faire aujourd’hui? Vital French in your pocket.... Rather than a complicated phrasebook, just print out our PDF vital French page or save this page to your mobile-phone before you go. A visitor pass is vital unless you want to waste hours standing in queues to get into the main sights. The Paris City pass (which is not the same as the heavily advertised and more expensive "Paris Pass") is the best value of the full Paris visitor passes - and includes about 60 monuments, free public transport (metro, buses), a Seine cruise, discounts in shops and on other attractions, and more. Buy online for delivery anywhere in the world. Copyright texts and photos © About-France.com 2003 - 2019 .